Introduction: In this article i am going to explain the use of transaction in Sql server with example using asp.net web application. Description: To understand the use of transaction i am going to create a situation where it is required to store the Employee's personal details like Name, age and address in one table and his official details like his department Name, his designation and the salary in another table. Employee will fill the details from the registration form as shown in the above image. In this case we need to execute two different queries to store the details in two different tables. 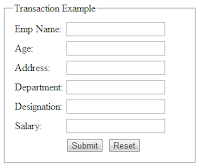 First query will store the employee's name, age and address in one table and second query will store the department Name, designation and the salary corresponding to that employee in another table. Note that second query is dependent on first query because the id of the employee from the first table will be required to store the corresponding details in another table. So we can group these queries and put that in transaction so that either all committed or nothing at all which is the characteristics of transaction. If anything goes wrong while executing these queries then all the changes made will be aborted. So using transaction either the full details of the employee will be stored or none will be stored which was our requirement. We can track the status of the transaction i.e. committed or rolled back so that we can display the appropriate message to the user whether the record has been successfully saved or not. Let's create an asp.net web application demonstrating this. 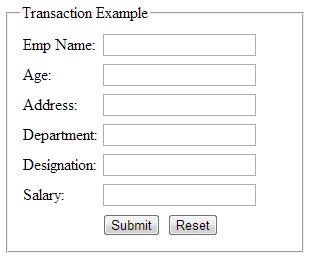 Create another table "EmpOfficeDetail" for storing the employee's official details like his department Name, his designation and the salary using the script below. Explanation: In the above stored procedure first i am storing the employee's personal details like name, age and address in the "EmpPersonalDetail" table then i am checking the error status using @@ERROR. If it is 0 then next i need to get the Id of the last inserted record. So using scope_identity() function id of the last inserted records is fetched from the "EmpPersonalDetail" table and then corresponding to that id, the official details are stored in the "EmpOfficeDetail" table and the changes are committed to the database using the COMMIT statement. If the @@ERROR status is not 0 then the control will be passed the Error handler where i have written the ROLLBACK statement that will abort the changes made to the database. So if the transaction succeeded then this stored procedure will return 1 otherwise 0. I will check the return value of the stored procedure in the code behind and based on that display the success or failure message to the user. Note: @@ERROR returns 0 if the last Transact-SQL statement executed successfully; if the statement generated an error, @@ERROR returns the error number. Note: scope_identity() returns the last identity value inserted into an identity column in the same scope. Let's create the asp.net web application to see the transaction in actual use.
" I hope you have got what are the transactions using the example above and If you like my work; you can appreciate by leaving your comments, hitting Facebook like button, following on Google+, Twitter, Linked in and Pinterest, stumbling my posts on stumble upon and subscribing for receiving free updates directly to your inbox . Stay tuned and stay connected for more technical updates." Hello Lalit! !..can we perform unit testing on asp.net snippets that you have explained in your site..if possible then please explain how,when and where to do unit testing considering various approaches like NUnit testing,MoQ testing,Moles on Asp.net website and Winforms applications..
running your storedprocedure it shown as "The ROLLBACK TRANSACTION request has no corresponding BEGIN TRANSACTION". what is the mistake?? Hi, pls see the below code and let me know how to fix.